The chrome hen steelhead had taken my fly so gently . Without any alarm or panic she shook her head and slowly made her way to the head of the run. Another steelhead fooled! I honestly didn't think that this fish had much size at all. As she turned downstream, I had the smug feeling of being in control. My plan was to lead the fish to my usual landing area at this spot and back the hook out. Suddenly the fish panicked and in an instant 10 pounds of silver bullet was greyhounding to the tail out of the run! All control was lost as the fish raced to the far bank. My fly line hissed in the water behind her as she tried to lose me! She made another wild run diagonally across my position and cartwheeled three feet into the air! Some how I knew that this fish was too wild to tame. Some fish just give you that feeling.The feeling of no control. As she landed in the water my nymph came free and the large October steelhead had won. The only consolation was that the run was full of "normal" sized steelhead and I had an enjoyable evening of catching and releasing four more steelies. All of this action had come after two fishless hours however . The confidence I had in the flies that I was using allowed me to push on and continue to cover the water until I found this concentration of steelhead. Choosing the proper fly pattern for steelhead can become a mind game, especially for beginners and novice fly anglers. This game can start your wheels spinning, or send your confidence to the gutter .However, choosing the proper fly may change your frustration to enjoyment and give you great satisfaction as another steelhead is fooled. Size and color are the most important factors in choosing a pattern to fish or tie for steelhead. Detailed fly patterns are nice to look at in your fly box but aren't necessary for hooking steelhead. Martin Schmiderer owner of the Exclusive Fly Fishing Lodge on the Copper River in British Columbia uses a simplistic approach to fly selection. The patern that Martin tied for us was the standard pattern for his lodge. It was an extremely simple fly , he merely wrapped some black nymph yarn on to the shank, leaving a tuft for the tail and finished with a short stubby wing of the same material. The fly is all black, and as the saying goes in the Northwest, use any color fly as long as its black. Fished on a floating line, just under the surface, this fly was responsible for many Copper River (Skeena tributary) steelhead. These fish were aggressive summer run steelhead in their prime . An advantage that Martin had is of course the helicopter. He would actually fly the river in a helicopter looking for pods of steelhead,then land on the nearby gravel bar and his guests would fish for fresh, unmolested summer run steelhead.I would probably get arrested for trying that stunt around here! Most steelheaders will go to great lengths to put themselves in the vicinity of a pod of fresh steelhead. They are memorable fish.. These steelhead are on the move and they will strike most any pattern with extreme predjudice.. In our Great Lakes region, the aggressive steelhead of summer and early fall are the best fish to pursue with the classic fly fishing techniques of the west coast masters. Fresh spring fish will respond to a classic swinging fly if the water temps are in the low fourties or higher. The spawned out "kelts" of late spring respond to classic fly fishing techniques as well. These fish fight very hard for a short duration and they jump often but lack the stamina of a fresh steelhead. Fly fishing for kelts is controversial but they do take a fly well..
Bill McMillan, is a wild steelhead fanatic and fly fishing traditionalist from southwest Washington. He wrote a book entitled Dry Line Steelhead. It is a very enlightening book indeed for those of us who are wild fish fanatics and enjoy pursuing our steelhead with a floating line. He prefers the floating line over any other line and uses no weight on his leader.His most productive technique is the wet fly swing. This technique presents the fly on the swing and with the proper mending will present the fly at any depth in a given run.The flies that he fishes deep are all sparsely dressed and are tied on large hooks.With a long leader the weight of the hook shank is all that's needed to fish the fly deep. An insect seine is a real eye opener in most steelhead rivers. Check out all of the caddis larvae and mayfly nymphs that you will find in the net after seining a riffle. . Imagine a fish that observes these insects drifting past them throughout their river life. They will see more of these nymphs at certain times. The obvious time is prior to a hatch. Another period is during the frenetic spring weeks of steelhead spawning or the fall period of salmon spawning. While the males fight and chase each other around the hen steelhead or salmon, using her strong tail, digs out a nest called a "redd" which is a depression in the river bed gravel. This violent action dislodges all sorts of material that is mixed with the gravel, including aquatic insects and depending on the season : steelhead or salmon eggs. In years of abundant steelhead runs many hens will dig a redd on top of another redd, previously dug by another steelhead.. This is of course detrimental to the hatching of steelhead fry , as many of the previously layed eggs are washed downriver never to have the chance to survive. These same eggs then become available as food to the steelhead and other resident trout in the river. Many times I have fished for steelhead that are holding downstream of redds and found many young steelhead smolts and brown trout . These small fish are gorging themselves on aquatic insects and the free drifting steelhead eggs. TLC is the name of the game here.. Those smolts are the future of your fishery. Barbless flies help and using a forcep to remove your fly will increase the chances that these little guys will make their way unharmed to the lake. The adult steelhead that are holding downstream of redds will feed as well. Fish nymphs and small, realistic egg patterns under a strike indicator with a floating line and prepare yourself for some wild and thrashing , leaping and crashing steelhead! 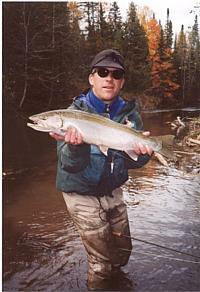 Over the past 17 years the following patterns have "evolved " (along with me) as successful patterns for steelhead throughout the Great Lakes region. Is this a fly? Yes it is , look at the San Juan Worms in your Big Horn fly box! Same simple concept. This pattern is designed to fish dead drift on a floating line. To be used without any splitshot on the leader. The weight is all in the hook shank. Copyright © 2019, Headwaters Fly Fishing Company - All rights reserved.